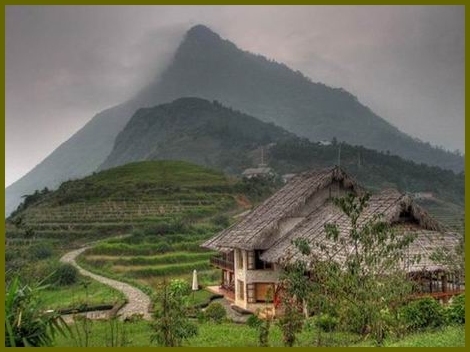 Topas Eco Lodge is situated in the perfect location at two cone-shaped hills set deep in the spectacular Sapa valley. Code words for the little place are simplicity, quality and character.Topas Eco Lodge provide daily transportation according to schedule from Sapa to the Eco Lodge. Even though the road is under constructing some parts are still dirt road. 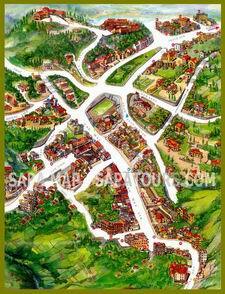 It takes about one to one and a half hour to go from Sapa to the Eco lodge. Despite the fact that some part are dirt road it is a interesting journey. On the way you will see daily life in the rice fields, minorities on there way to Sapa to sell handcrafts, vegetables etc. The restaurant and reception will provide the services needed to satisfy 50 guests at a time. 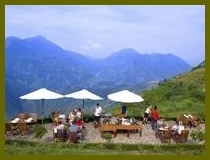 In the Thai stilt house restaurant the lodge offer meals three times a day. Topas Ecolodge is based on ecological principles, 25 bungalows made of white granite from a nearby quarry, and roofs thatched with palm branches. 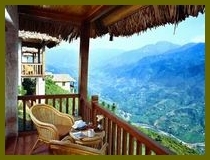 All bungalows are double or twin rooms with private balcony offering a magnificent view over the valley. The lodge has also implemented a solar system that produce electricity for the bungalows.